The McComb depot was built by the Illinois Central Railroad (IC) in 1901 and is known as a “combination” depot since it included passenger and freight functions under one roof. Typical of early 20th century station design, the one story wooden structure has a central section flanked by two wings. Exterior clapboard emphasizes the building’s horizontal orientation while a hipped roof includes wide eaves to protect passengers from inclement weather. Trackside, a projecting three-sided bay with windows allowed the station master to monitor traffic on the line. One wing housed the freight room, easily identified from the outside by the large doors that allowed carts laden with crates and packages to be rolled between the depot and the train. Security was enhanced through a limited number of windows, which were small and placed high up on the wall. The depot and more than five dozen surrounding buildings are listed on the National Register of Historic Places as the Kramertown-Railroad Historic District. 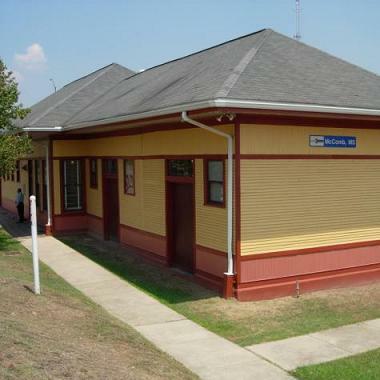 The depot currently houses the McComb Railroad Museum and a waiting room for Amtrak passengers. The museum has nearly 1800 railroad artifacts and also owns several pieces of railroad equipment. Visitors marvel at IC 2542, a 200-ton Mountain-type steam locomotive with eight drive-wheels that was built by IC in its Paducah, Ky., shops. These locomotives were constructed from the boilers of another class of locomotives with 10 drive-wheels. Seventy-four locomotives of this type were built, of which only two now survive. Behind the locomotive is IC 51000, a one-of-a-kind aluminum refrigerator car built by the railroad at the McComb Shops across from the depot. The 51000 is followed by a 1966 cupola-style caboose built at the railroad’s Centralia Shops in Illinois. This was the largest class of caboose used by any railroad in the country. The museum also recently acquired IC 100417, a crane capable of lifting 250 tons, and its accompanying tool car, as well as a 1914 Railway Post Office car built by the Pullman Company and an 1883 office car. Amtrak passengers can see the display equipment as they look to the west when the City of New Orleans makes its way to and from the station. They can also see the IC’s famous “green diamond” emblem, etched in colored masonry, next to the station. The McComb Shops remained a major component of the IC rail network until their closure in 1987. In 1998, IC was purchased by the Canadian National Railway (now CN), the current operators of the track through McComb. The depot was renovated in 1998 by the Mississippi Department of Transportation (MDOT). $402,256 in funding from the Federal Highway Administration’s Transportation Enhancements program was supplemented by a $100,564 local match. The shelter was financed with a MDOT local service transportation grant. In October 2012, the city won a $100,000 Mississippi Makeover grant from Entergy Mississippi, Inc. that was used to improve the downtown area surrounding the historic depot. The energy company initiated the program in 2012 as a way to help the communities it serves improve their quality of life and attract new investment. The grant was divided into a $50,000 cash award and $50,000 of in-kind contributions. Partnering with the McComb Main Street Association, the city submitted a project proposal to develop the Ironwood Greenway, a beautification project along the railroad right-of-way that runs through town. Volunteers, including many Entergy Mississippi employees, worked together to clean, clear and landscape the rail yard boundaries and public lands along the approaches to the depot. As part of the project, community leaders also worked with Entergy volunteers to light an historic coal chute; create a green screen with Leland cypress; restore period light fixtures; provide seating at an observation point and erect historical markers. City leaders believe the enhancements will improve visitors’ impressions of McComb and encourage tourism. McComb was chartered on April 5, 1872, by Colonel H. S. McComb, president of the New Orleans, Jackson, and Great Northern Railroad (NOJ&GN). McComb, for moral reasons, desired that his company’s locomotive and car shops be located outside of New Orleans and thus away from the negative influence of saloons. McComb purchased what is now the city of McComb, erecting shops and offering discounted lots to employees with families. In the McComb charter, it was stipulated that no alcoholic beverages be sold within city limits. It has since been repealed. In 1877, Illinois Central purchased a controlling interest in the New Orleans, Jackson, and Great Northern and the Mississippi Central. However, these lines could not immediately be integrated into IC, because unlike the standard gauge (4’ 8.5”) Illinois Central, the NOJ&GN and Mississippi Central were built on a 5’ gauge. This difference required that cars interchanging between the lines at Cairo be jacked up and have their 5’ gauge wheelsets replaced with a standard gauge set before they could proceed north. This process cost the railroad time and money and so almost immediately the railroad set about rectifying this problem. On July 29, 1881, 3,000 men under the direction of General Manager James Clarke converted the 548 miles of 5’ gauge track to standard gauge in a single day. On January 1, 1883, a 400-year lease of these companies was initiated by IC, linking Chicago to the Gulf of Mexico with one unified railroad company. By 1905, McComb also boasted of the 120,000-square-foot McComb cotton mill and the McColgan Brothers Icing Plant, the first such plant in the south. The icing plant was used to ice refrigerated boxcars, allowing the shipment north of perishable food items by rail. In 1958, the largest oil discovery of the year was made in McComb. Extraction of the oil remains ongoing, and the landscape around McComb is spotted with derricks. McComb is also the birthplace of Sim Webb, John Luther (Casey) Jones’ fireman. On April 30, 1900, the New Orleans Special struck a freight train at Vaughn, Miss. killing engineer Jones. The wreck was later immortalized by the ballad “Casey Jones”, composed by Illinois Central roundhouse worker Wallace Saunders. Other tragedies have struck in and around McComb. In June 1904, a coal-oil lamp overturned in a laundry and flames spread to a nearby livery stable on North Front Street. Two-thirds of the city’s business area burned to the ground and sixteen horses died in the flames. In October, 1977, a chartered flight carrying 26 individuals crashed near McComb in Gillsburg, Miss. Among the dead were Lynyrd Skynyrd members Ronnie Van Zant, Steve Gaines, and Cassie Gaines. McComb has been the birthplace of many notable figures throughout the years including blues musician Bo Diddley, actor Jimmy Boyd, baseball player Adrian Brown and pop sensation Britney Spears. McComb has been voted the “Hospitality City” of the “Hospitality State.” It is also known as “the Camellia City of America,” and is home to more varieties than can be found in any other location in the United States. Amtrak does not offer ticketing or baggage services at this facility which is served by two daily trains.